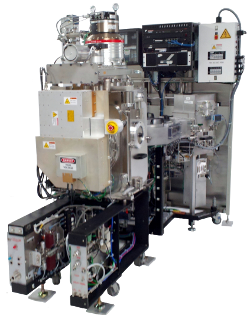 The industry legacy single PVD cluster system has a wide range of thin film deposition and etching processes. This is a very versatile tool that can be configured for a variety of applications. The remanufactured system inherits all of the fully maturated industry processes and long term stability. The hardware is upgraded to protect against obsolescence, implementing a DeviceNet/PLC control system for better reliability and flexibility in both process and maintenance. The industry legacy CORONA PVD system can be ordered in many different configurations. Typical arrangements include up to four individual targets processing eight, six inch wafers per run utilizing thin film deposition processes. It is an ideal tool for low cost optical films, such as SiO2, Al2O3. Other metal film depositions with reliable and long term stable processes are easily adopted. 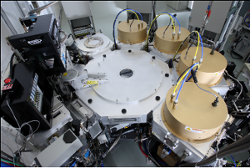 The remanufactured and upgraded system now has the capability to run up to six, eight inch wafers per run with two sputtering targets. Industry legacy 6-Target GMR PVD system continues to be a great platform for multi target GMR PVD deposition. It is the perfect tool for multilayer thin films such as GMR stack deposition. 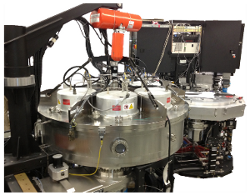 The remanufactured and significantly upgraded system now has the capability to run 8" wafers. Paired with redesigned magnetrons and a new wafer chuck better GMR, magnetic properties and excellent thin film thickness uniformities are now repeatedly produced. Like the rest of our lineup, the new DeviceNet/PLC control system joined with our single platform software provides unbeatable reliability, in both process and meantime between failures. This easily upgradable platform protects against obsolescence. Long time industry legend, the legacy RF350 ion beam etching (IBE) system, has a wide variety of applications in fields such as MEMS, data storage, & MRAM. Other industries include micromachining, SAW filters, photomask, limited semiconductor, patterning and shaping of IC devices. Our remanufactured and upgraded systems are available in a multitude of combinations. We can accommodate most any configuration request. Some popular options include the capability to run up to 8" wafers with excellent etch uniformity, united with our newly designed source and optional fast acting shutter on fixture. With our new source and grid combinations, we offer an expanded range of etch rates from ~2nm/min to ~100nm/min, with great uniformity. Our most recent industry leading breakthrough for the IBE is a fast tilt direct-drive assembly, capable of lightning fast speeds while maintaining unbelievable accuracy. Additionally, this provides the ability to perform simultaneous tilt and rotation sweep mode, great for removing sidewall redeposition in difficult to reach locations. If you are familiar with previous versions of IBE tilt drives, this option truly must be seen to believe. For short process time applications, this option is a must, increasing throughput by over 400%! The system now has the latest up to date hardware & software to protect against obsolescence. New DeviceNet/PLC control system provides unbeatable reliability, in both process and meantime between failures. When pooling this package with the industry’s best lead times and lowest cost of ownership makes this package a winning combination against any competition. AVP IBE systems are not just great ideas in a boardroom or on your computer screen; these are production worthy proven systems installed worldwide. AVP has dozens of these systems installed throughout the world running 24/7 with proven reliability and outstanding uptimes. If and when difficulties might arise, we have a track proven team of professional engineers ready at a moment’s notice to solve your most difficult issues. Another industry legacy, the internally coupled plasma reactive ion etch (ICP/RIE) system delivers high plasma density, low operating pressure, high etch rate, excellent etch uniformity and low energy ion damage. 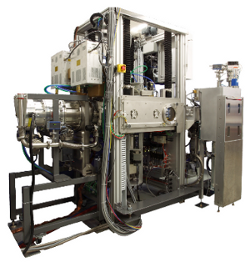 The system incorporates a wide range of thin film RIE processes for many applications. The remanufactured and upgraded system inherits the fully matured industry processes and long term stability. However, the system now has the latest state of the art hardware and software to protect against obsolescence. The new DeviceNet/PLC control system joined with our single platform software provides unbeatable reliability, in both process and meantime between failures. 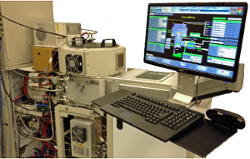 Unlike most stand alone ICP/RIE systems, this system is capable of being combined into a cluster tool with a central wafer handler. This will greatly reduce the possibility of oxidation between processes. AVP has several of these tools running 24/7 production with proven reliability throughout the world.